OTTAWA - North of Canada’s capital, underneath an endless expanse of spruce, pine, and birch, ticks what some scientists are calling a carbon bomb: Peat. A thick layer of the black spongy soil, the remnants of ancient forests, wraps the globe’s northern tier. Deeper than 15 feet in places, the peat layer extends over more than 6 million square miles across Russia, Scandinavia, China, Canada, and the United States. Carbon that those forests absorbed from the air over thousands of years is stored in the peat and suspended in waterlogged bogs or permafrost. When it is disturbed or drained - as is happening in some areas - the peat can start to decompose and dry out, unleashing greenhouse gases. In North America alone, the peat and the trees growing in it hold as much carbon as would be emitted worldwide by 26 years of burning fossil fuels at current rates. While a critical deal is being brokered at the Copenhagen climate talks this week to protect threatened tropical forests, a growing number of scientists and environmentalists say the world’s boreal forests need to be conserved too. A group of international scientists are planning to deliver a letter to Northern heads of state tomorrow urging them to formally recognize the importance of the boreal forest and find ways to finance its protection. And they say Canada, with 1.4 billion acres of intact forest and a majority of the world’s peat lands, is the place to start. The pace of boreal deforestation from mining, dams, oil and gas drilling, and road building is glacial compared with the destruction of tropical forests. Still, scientists say development is beginning to accelerate and it needs protection before warming temperatures lure even more industries north. Mining and similar operations can cause the release of carbon from peat because the land is often drained, exposing the material to oxygen, which is essential for decomposition. Poor logging practices, road building, and other development can alter water flows and expose peat as well, drying it out and making it vulnerable to fire. Dried peat burns so well it is used as a cheap fuel in parts of the world. Many point to Indonesia - one of the few tropical forests with underlying peat - as a cautionary tale: Deforestation and draining is causing the peat to burn and pump enormous amounts of carbon dioxide into the air. To fly over the northern forest is to experience ancient, nearly-unbroken vastness. Swamp-like - it has been described as a kind of giant Everglades of the North - tiny aboriginal communities, logging roads, and clear-cuts stand out in its southern expanse. In the more frozen north, only icy lakes and rivers interrupt the thousands of miles of tree cover. Caribou and wolves roam underneath the evergreens, and every summer, millions of birds arrive to breed, including the white-throated sparrow and many species of ducks that winter in New England. The boreal forest - with its hues of muted green, gray, and brown - once blanketed New England as well, but warming temperatures since the last Ice Age have transformed the forest, although some peat lands and boreal tree and wildlife species remain in northern Maine, New Hampshire, and Vermont. Unlike most of the tropics, where decaying plant matter decomposes quickly, the boreal forest accumulates dead sedges, mosses, grasses, shrubs, and trees in bogs or in permafrost, permanently frozen soil that can store it for thousands of years. About 30 percent of the carbon is stored in the trees - the rest is in the peat. “For a long time, we failed to see the soil for the trees,’’ said Larry Innes, director of the Canadian Boreal Initiative and adviser to the Pew Environment Group, a funding and advocacy group. 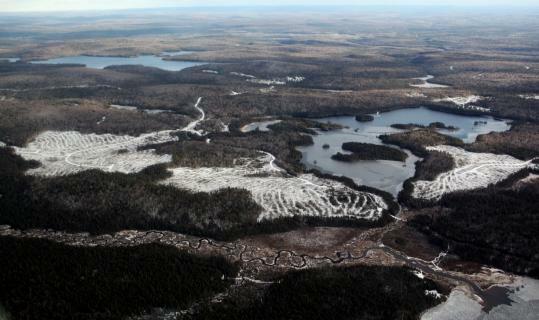 Innes talked as he piloted his small plane over hundreds of tiny peat islands capped with spruce trees in lightly iced lakes about 150 miles north of Ottawa. Fluctuating water levels in a reservoir for a hydroelectric dam had eroded peat from the shorelines, allowing some of its carbon to be released and leaving sand behind. Enormous clear-cuts - miles across - opened the landscape nearby. While the northern forest’s beauty is undeniable, it is tropical forests, with their towering tree canopies and enormous number of colorful and charismatic species that have riveted the world. And, scientists say, there is good reason for that: Agriculture and development are causing massive deforestation, totaling more than 20 million acres a year by some estimates, and the forests are being further degraded by illegal and shoddy logging practices and fire. Because it is more valuable to cut trees than to preserve them in these areas, Copenhagen negotiators are trying to make it financially attractive to conserve trees in developing countries. The Kyoto Protocol, the climate treaty that expires in 2012, largely ignored forests as critical tools in fighting global warming, though deforestation - and the resulting loss of carbon-absorbing capacity - accounts for about 15 percent of the world’s greenhouse gas emissions. But the boreal forest - holding twice as much carbon per acre as tropical forests - also needs a place at the table, scientists say. In Canada, deforestation - defined as permanently cleared land - is estimated at about 126,000 acres a year, although scientists say development and industrial uses alter far more of the forest. That figure also excludes logging. In Alberta, with its enormous mining effort to squeeze oil from tarry sands, only about 40 percent of its once vast forest is still considered intact, according to Global Forest Watch Canada, a research group. In 2007, an international group of 1,500 scientists, some on the leading scientific advisory group, the Intergovernmental Panel on Climate Change, recommended that at least half of Canadas forest be protected from further disturbances, both for its carbon storage and wildlife habitats. While the Canadian government is facing deep criticism for backtracking on pledges to reduce greenhouse gases, the provinces of Ontario, Quebec, and Manitoba have promised to protect enormous swaths of forest from future mining and development - roughly half of Quebec’s and Ontario’s forest, which is largely publicly owned but can be leased to industry. But paying for it will be challenging and there is no clear mechanism to do so. In Copenhagen, negotiators from developing countries and the United Nations are trying to win financial commitments from rich countries to protect tropical forests, or create a system where polluting industries pay to protect a swath of trees that would absorb the equivalent amount of heat-trapping gases they emit. Yet the advocates for the boreal forest say it is vulnerable because northern regions are heating up faster than more temperate areas, which could cause the peat to thaw and release its carbon. No one knows how quickly emissions will occur if that happens. Correction: Because of a reporting error, a previous version of this story incorrectly described a group that recommended the protection of Canada's boreal forest. It was a group of 1,500 international scientists, some on the Intergovernmental Panel on Climate Change, who signed a 2007 statement to urge protection, not the IPCC itself.